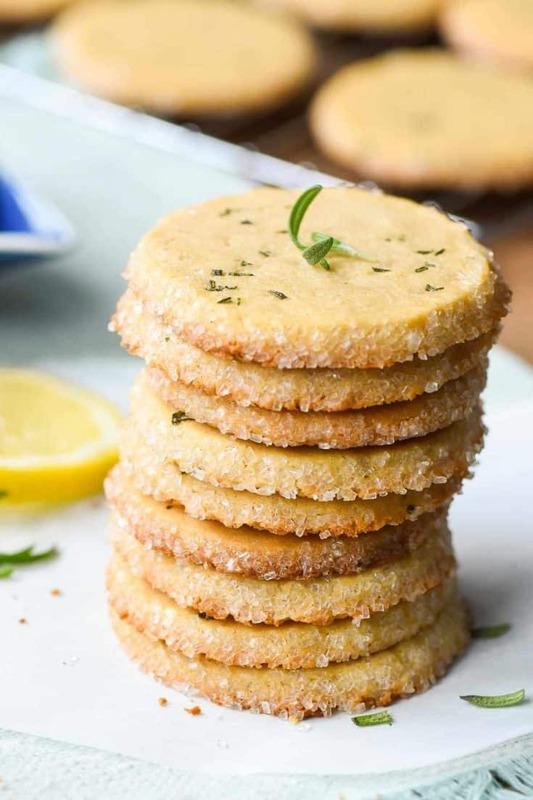 These rich Lemon Rosemary Butter Cookies are simple to make and have a wonderfully buttery, bright, herby flavor. They’d be perfect on your Easter table! A few years ago I picked up a copy of the Fannie Farmer Boston Cooking School Cookbook (<affiliate link). The cookbook was originally published in 1986, but my “updated” version was a ninth edition published in 1956. The pages are worn and yellowed, dotted with drops of sauce and oil from who knows how many cooks before me. There are no glossy full page photos or step-by-step instructional images. Instead, it’s 800 pages packed full of simple, made from scratch recipes for everything you can possibly imagine. A quick perusal of the book makes it clear cooking has changed a lot since the early 20th century. You won’t find many recipes for Raisin Sauce (to be served with ham or tongue) and Prune Whip on Pinterest these days. At the same time, it’s also clear so much remains the same. 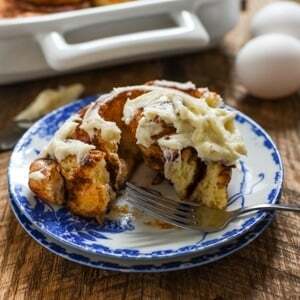 Amidst some of the more unusual (for us) recipes, I have found many tried and true favorites. I find myself returning to the Fannie Farmer Cookbook often, especially when I’m in search of a classic recipe that I know will stand the test of time. 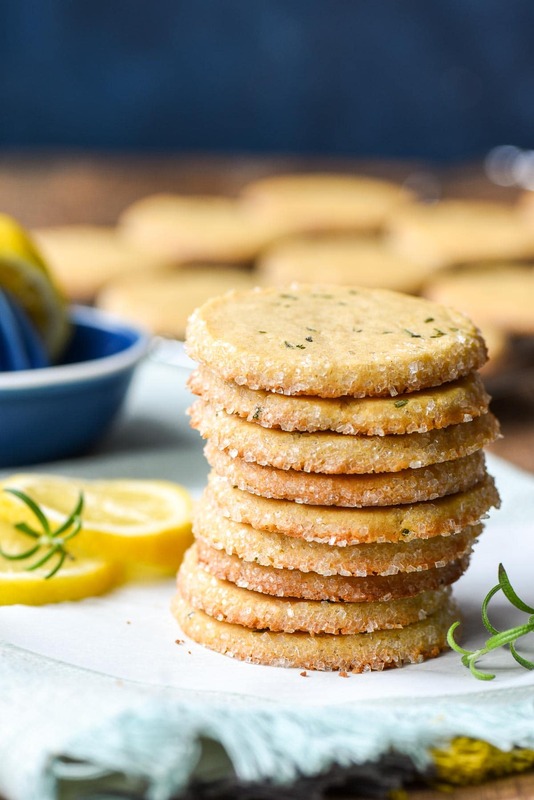 Among my favorites in the book are these Lemon Butter Cookies. Butter cookies are similar to shortbread, but with a slightly higher sugar to butter ratio, and, in some cases, the addition of egg yolks. The resulting cookies are rich and buttery but sturdier than shortbread, making them perfect for cutouts. Fannie’s recipe already included a fair helping of lemon juice and zest, but also used cinnamon and clove for spice. I was looking for something a little less Christmas-y, so I omitted the spices and added a sprinkling of chopped fresh rosemary instead. 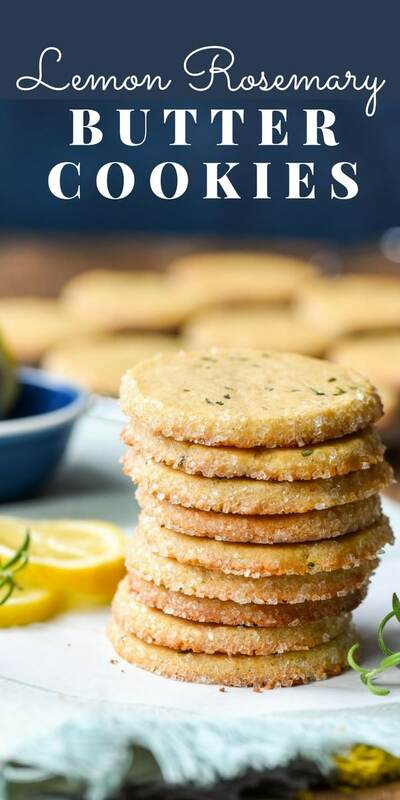 I know the thought of adding fresh herbs to a cookie might seem a little strange, but it gives these cookies the loveliest flavor. 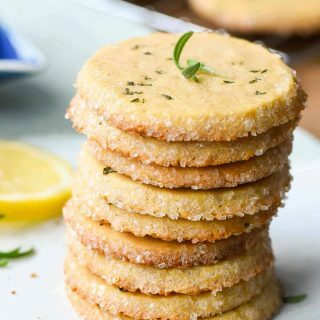 The scent of rosemary and citrus alone is mouthwatering, but every sweet, buttery, and lemony bite will convince you that this combination was meant to be. I cut these cookies out into simple circles and rolled them in sparkling sugar sprinkles (<<affiliate) for a little spring bling. That, plus the flecks of rosemary in the dough, make these cookies an effortlessly lovely option for Easter celebrations or spring gatherings. The Mr. and I both loved these and found them hard to resist. I had to give some away and freeze the rest to keep my hands off of them! I think you’ll find, like I did, that Fannie Farmer knew just what she was doing with these Lemon Butter Cookies! 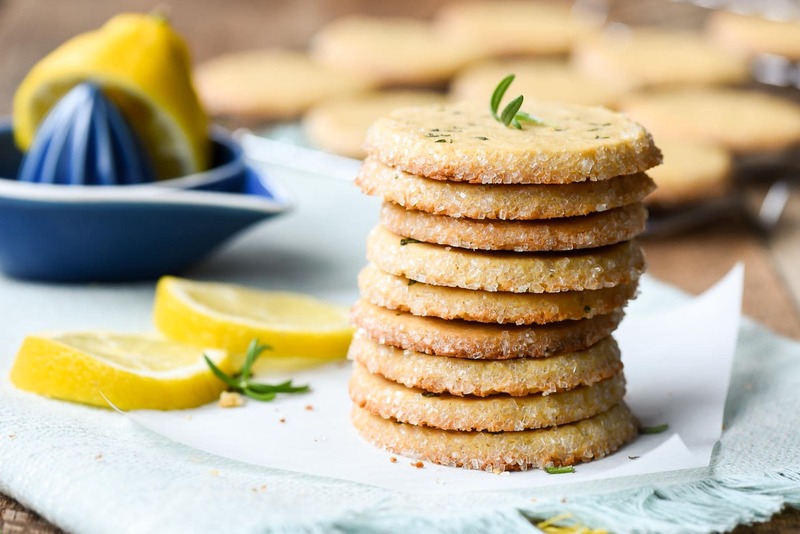 If you’re looking for more bright, lemony spring recipes, try my Lemon Cream Sandwich Cookies or Lemon Blueberry Crumb Bread! 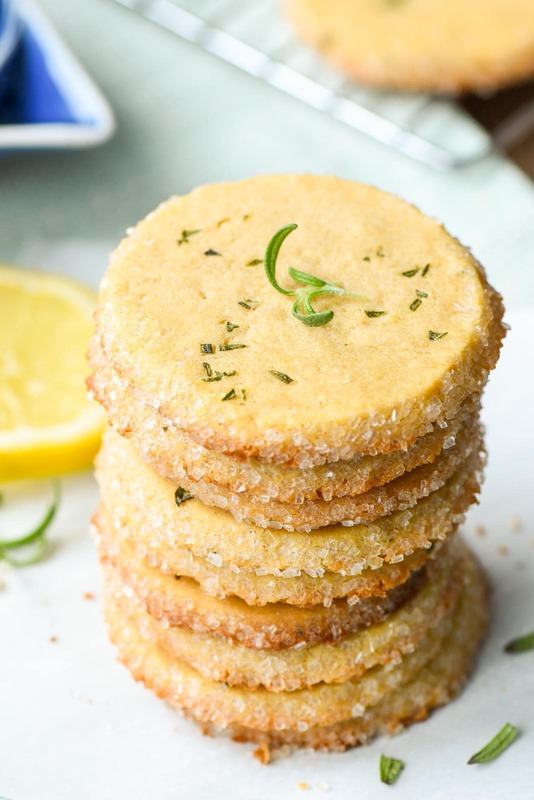 These simple Lemon Butter Cookies are soft, tender, and buttery with a subtle hint of rosemary. In the bowl of an electric mixer, cream together butter and brown sugar until smooth and fluffy, scraping the bowl as needed. Add the eggs, lemon zest, and lemon juice and beat until smooth. Sprinkle the salt, rosemary, and flour on top. Beat on low speed until the dough comes together and no streaks of flour remain. Pat the dough into a ball and set it on a piece of saran wrap. Wrap the dough up then pat it down into a rough rectangle about a 1/2 inch thick with your hands. Refrigerate for at least 2 hours or up to 48 hours. 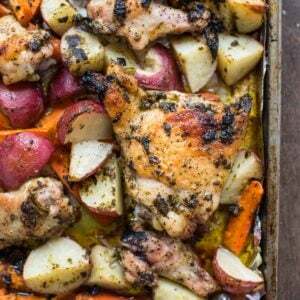 When ready to bake, preheat the oven to 350 degrees. Line 2 baking sheets with parchment paper. Place the coarse sugar in a bowl. Lightly flour your counter top then place the dough on top. Flour a rolling pin, then roll your dough out to about 1/4 inch thick. Using a cookie cutter or small juice glass, cut circles of dough out. Roll the edges of the dough in the coarse sugar then line up on the parchment paper, spacing at least 1 inch apart. Re-roll and cut the dough until none remains. Bake for 8-10 minutes or until edges are very light golden brown and centers look set. I feel the same way! I need these to be on hand at all times now. So many classics in there! I feel like she is the lesser known, American version of Julia Child. I’m sure you would enjoy the cookbook! These sound wonderful. Would it work to roll the dough into logs and slice and bake? Seems like it should work. I haven’t tried it, but I do think that would probably work! You might want to slice and bake one to start just to make sure, but I think you should be good! My husband is gluten free, so could the regular flour be replaced with gluten free flour? I haven’t personally tried this with GF flour, so I can’t guarantee it would work. I would definitely use a cup for cup all purpose GF flour if you try it. Good luck! The recipe is not clear on a point. Step 1 says – add sugar – It does not say if it’s just the brown sugar or both the sugars. However, later on in step 5 – it says roll the ” dough in the coarse sugar”. I’m assuming I should only add the brown sugar in step 1 and save the coarse sugar for step 5. I’m so sorry about that! I’ve had some issues with my recipe plugins scrambling the ingredients, so the ingredient list was out of order. It’s all fixed now, and I made the instructions clearer as well. Your assumption was correct, though! Just the brown sugar goes in the dough and the coarse sugar goes on the outside. I hope you enjoy the recipe!